Mindful and practical approaches to raising our little bees, in a world of possibilities. Some summer reading…not for fun, but it actually was! As the school year drew to a close and I began thinking of some of my summer projects I might attempt (and by attempt, I mean, wish to start! 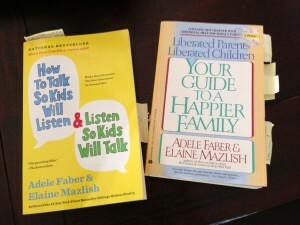 ), I came across a neat article that mentioned a fabulous parenting book and workshop. This was actually a book I had already purchased and was sitting on my bedside table, barely opened. The book, How to Talk So Kids Will Listen and How to Listen to Kids Will Talk (further noted as the Listen book) by Adele Faber and Elaine Mazlish, is an oldy but goody in the parenting and child development world. My daughter’s preschool teacher had recommended it during one of our parenting discussions, and I had fully intended to read it. What motivated me though, was that the article I had read, spoke highly of the parenting workshops that accompany the book and which you can do on your own. I knew if I was really going to read the book, and stick to utilizing the strategies, a workshop would be much more motivation for me to do so. Seemed like a good project, and very worthwhile. I can’t say everything in the book applied to parenting a one and three-year-old, yet at the same time, it gave me ideas for how I might appreciate using some of the strategies as my daughters grow and become teenagers. It certainly did expand my tool box of parenting techniques, especially when dealing with getting a preschooler to cooperate, or calm down. The second book, Liberated Parents, was also awesome. I think I enjoyed it even more, yet the Listen book had a nice layout to the concepts and had many components of the participant handbook imbedded in it already. The Listen book has great comics to illustrate the correct ways to use the strategies, which for my husband, was his kind of reading! Beyond the reading however something else really awesome happened. The seven other mothers and I had a nice built in discussion and support group to help each other tackle the woes of mothering young children. The book could easily be read alone, utilized, and possibly even forgotten. Yet, having the DVD to watch, the participant guide to record in, and the discussion group for chatting together, it really helped ingrain the learning I was doing, and forced me to remember to try out what I was reading. At the end of the six weeks we all felt the class was worthwhile, and are hoping to continue our discussion group on our own in the future. Our next book is another Faber and Mazlish book, Siblings Without Rivalry, as all of us have, or will have, two children, and sibling relations is high on our list of parenting skills to tackle. The key to reading and truly using many of the self-help books is, I find, practice, and remembering to practice. 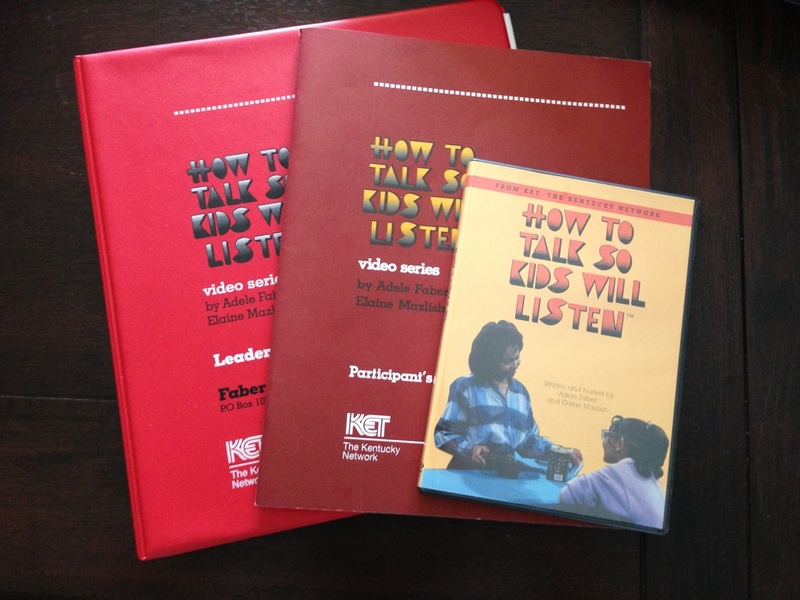 This workshop really engaged me in doing so, and I was also impressed by the authors take on dealing with children. Some of what we learned we already did as parents, and other things were new and not as common-sense as we had thought. To help us really remember to practice what we read, the Listen book has a handy page at the end of each chapter with bullet points of the main ideas. I decided I needed to refer to this often if I was going to remember to continue to use these great strategies. So, I made us all a handy flip book with each of the chapter highlights. I hung it on a nail in my bathroom next to our mirror and every morning and night I read one of the highlights while brushing my teeth, and it is all I need to help refresh my mind, and keep me practicing. If anything, my husband reads it too, and as so many moms know, parenting is a team effort. Both captains have to have the same rules and be aligned as much as possible. So far this has been a helpful “playbook” for both my husband and I to refer too, and I hope we continue to do so as the girls age. At first glance the books target parents who want their children to listen and cooperate, and of course, who doesn’t? Yet as we really delve into the books content, it is about raising confident, respectful, happy children who make good choices as the grow into adulthood, and their independence. How we as parents foster those skills comes a lot from how we discipline them and model those skills as well.To do that, we need to treat our children with the mutual respect they deserve. That was my big take away message from it all, and well worth this project! If you have any questions about the book or the workshop series, send me an email, I’m happy to help! 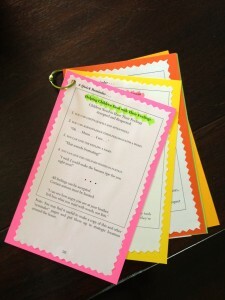 This entry was posted in parenting, Positive Discipline, preschoolers, Uncategorized, Words of Wisdom and tagged discipline, How To Talk So Your Kids Will Listen and How to Listen so Your Kids Will Talk, parenting. Bookmark the permalink. Receive the buzz via email! My posts are not in chronological order, rather, I write them as I feel passionate. Please use the categories or search bar to locate a particular subject you may be looking for, or even view topics by their respective age range. This blog is a constant work in progress, so check back often for new features and resources! 15 Disneyland Tips and Tricks! Thank you to my helpers, where would I “bee” without you!